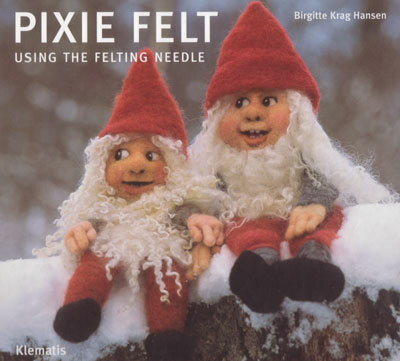 This is a book about pixie needle felting and a follow up to the previous book by Birgitte Krag Hansen – New felt using the felting needle. To felt pixies is one of many subjects where the felting neddle is most suitable. The barbs of the needle make it easy to create simple and more detailed faces and bodies of the wool, and you only need very few materials to get started. With the felting needle you don’t have to use water and soap at all. Birgitte Krag Hansen has developed a whole series of new models as well as a simply way of building up a face that can be used for other figures as well. The book is well illustrated with step by step pictures of the process as well as finished pixies. It is written both for beginners and for more experienced felters. Children from about nine or ten will be able to use the book on their own or with some adult help.